I've always been interested in meditation but never got around to it. Then I read a great book which was recommended by Charlotte. Followed swiftly by an article which breaks down an easy way to meditate on the move. I try to meditate now as much as I can but failing that I at least take some time to breath deeply. Can you remember the last time you really breathed, a big in and out breath? I thought this was all the time for me but at times of stress, tiredness and general every day 'I have no time and lots to do' it seems I breathe really shallow breaths. So if you can't or don't want to follow the steps below, at least sit quietly and really breath, it makes such a difference. As you come back to the present try and have a gentle stretch then think of something you are grateful for. This thought will stay with you for the rest of the day. If all else fails then this should work! 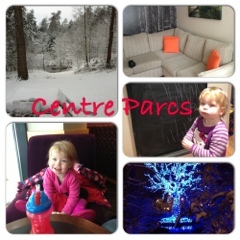 The snow arrived and we headed to Centre Parcs. Having been before, the snow made a great backdrop and gave the experience a different twist. 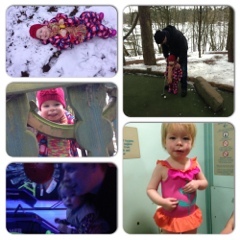 Bubba loved it and this is a few of the things we got up to. Moments and memories are changing and forming all the time now with Bubba, she seems to be growing up in every way, every day. Her sense of humour is getting stronger and so is her determination, she is certainly a girl who knows what she wants! She is getting good with colours, her favourites are purple, blue and yellow (lello). She says and points them out at every opportunity, wherever we are. She likes to count but only says one, two and nine! Other new words: tortoise, giraffe (although this is raffe at moment), snow (which there is a lot if at the moment) and she is stringing sentences together which is very cute. Climbing climbing climbing...she stands on my feet whenever she can and anything else that she can. Her new favourite place to be is standing on the sofa (after having chucked all the cushions and large back cushions off). She then proceeds to shout loudly that she is 'stuck' whilst lying down and rolling around. 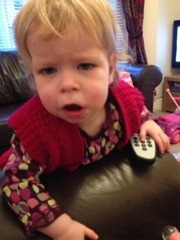 Roll play is making an appearance, bubba will make tea from her pretend tea pot and pretends to go 'shops'. She will make her happy people climb stairs (bit obsessed with stairs) and fly. She also likes to label things as 'mamma', 'dadda' & 'babies' and this can be any object, person or piece of food (big things are Dadda, very small things 'babies' and always plural, mamma's are anything in between. Fighting sleep more and more and if you ask her now if she wants to go to sleep, her immediate answer is "no". We have the final four back teeth causing havoc with a fair bit of waking up in night and this has been taking its toll on all of us (teeth are yet to appear). I'm very jubilant when she has slept a whole night now and hope they become a regular feature again. 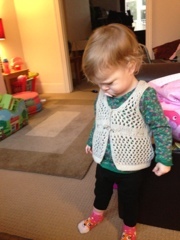 She has started to sulk a little and will take herself off to a corner and pout. Tantrums are at the moment few and far between but she does seem to get more frustrated with things so I'm sure they aren't far off. I recently wrote my resolutions and included my hope to cook a different meal each week and I've been keeping it up. It may not be new ingredients but just a different way of using them. Put the chicken into a sandwich bag (or clingfilm) and flatten with rolling pin until about 1/2 cm. 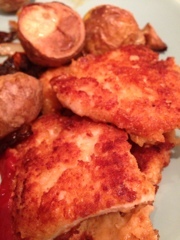 Then dip the chicken pieces into the flour, then into the egg and then the breadcrumb mix. 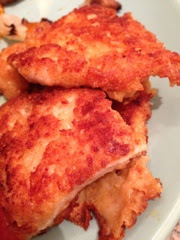 Fry in a pan each side until golden and fully cooked. Enjoy (we had it with roasted vegetables and small potatoes roasted in their skins. In retrospect (it was only last week!) I should have had a resolution that I'd worry less about how much my child does or doesn't eat. For instance, yesterday for dinner, I presented her with sausage casserole with broccoli and green beans. My thinking behind it was that she eats sausages, devours broccoli and treats green beans like sweets. Well that was the theory but in practice she ate none of it...tried to tell me the sausage bits were hot (they weren't), pushed the broccoli to the edge of the plate and left the beans untouched. Last week she refused one of her favourites, chilli and rice. So in a last ditch attempt I thought if she wasn't going to eat it then we might as well play with it. 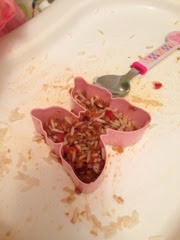 I got some butterfly shaped cutters out and we stuffed the food in and made butterflies. She then picked up a handful and shoved it into her mouth and we carried on this way until it was all gone! So this year I'm not going to sweat the small stuff, so what if she decides against her meal, I sometimes don't fancy certain things. The rest of the day she ate well, breakfast was a pancake and raisins, a mid morning snack of grapes, crackers at lunchtime and 95% of my chicken sandwich so I was left with a limp salad ensemble. Afternoon she had a whole banana and half of my apple (can you see a pattern there!) and ate some cheddar with balsamic onion in it with breadsticks after her aborted dinner. I worried before that she'd wake in the night hungry and it would be a nightmare (I love my sleep and hate interruption to the point it gives me panic attacks) but so what. She hasn't woken through hunger (that I know of in her life yet) besides she still wakes us in the night anyway at the moment because she's teething (again - oh how I hate those pesky cute stumps). If she ends up being an adult that only eats cheese sandwiches then that will be her choice and she'll watch her father and I tuck into all manner of more interesting feasts. 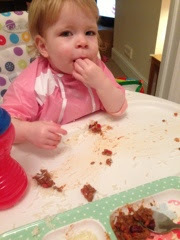 So this year, I'm going to sit it out and enjoy her strong sense of herself and her choice of saying 'no' at meal times. I'm not forcing her (who am I kidding, as if she'd let me try and force her) and I'm going to do my best impression of bright and breezy as I remove a rejected dinner that I've slaved over. It's the long game I'm going to focus on, as long as I keep trying her on new things then my job is done. 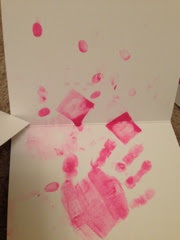 We didn't get prints done when Bubba was tiny, instead we waited until her hands were a bit bigger. Mainly because at new born stage all babies have small hands and feet and I can recall how tiny she felt in my arms (and partly because we just didn't get around to it). We made the decision to get prints done when she reached the rip old age of 18 months because that's what I'll forget, the way she holds my hand to lead me somewhere and how good it feels. This print was for my parents for Christmas but I'm now so in love with it that I'm getting a second done for me (hopefully for Mother's Day). They can be done in all different colours and frames and whatever writing you require. It's lovely to put my hand against this one and remember (already) of the little hands we created. I was always aware of bubba's needs when she was little. 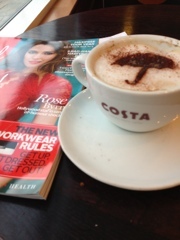 I read all the books and magazines, knew how to get through the early weeks and months. I was prepared. 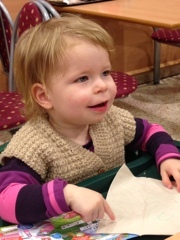 I feel more lost than I ever did before, at nearly two she is an unknown quantity. Her words are multiplying daily and you can see her brain ticking over and her power of persuasion deepening. She is learning the power of words, now she uses different tones to call me, depending on the urgency of her need. 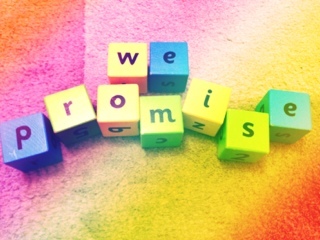 A persuasive 'mamaaaaa', a defiant 'NO!' and a pleading 'Pleeeash' if she wants something. She hasn't mastered arguing yet but she is reluctant to give up on something once she has set her mind to it. I'm no longer in the driving seat, she makes all the decisions and I just have to follow whilst pretending I'm in control. It never stops and I'm mostly exhausted, mentally. I go on a roller coaster of emotions daily (sometimes hourly) and each new day brings more challenges and self doubt. Perhaps it's the time of year but its getting on top of me and the fears and doubt are taking up valuable brain space. I've just got to work on my negotiating skills. Just to start off, I'm a great lover of lists but not really a fan of new year resolutions because for me they just never last so its pointless really. I don't usually make it into February with the new 'me' ideas. I've held off posting this because everyone seems to be doing it but equally this is an blog for me to look back on and I need reminders so sorry if it's a bit boring! So back to my love of lists, this ties nicely into a list of things I'd like our family to do this year (and just as an extra caveat, I started this list before the new year). They are fairly simple things and probably things we should be doing anyway and a few (like going to bed early and reading more books) are more for the Hubby and I. This is a must for me especially as I'm less able to cope with the early mornings and middle of the night wake ups the more they happen. I generally cope better and can tolerate more if I have had at least seven hours sleep so early to bed and early to rise will make me a nicer person to be around. We are generally good at cooking from scratch but we have recently been getting a bit slack on coming up with new recipes for all of us. So each week I plan to dig out my recipe books and cook something (perhaps not new ingredients) a different way. Watch out Instagram for my new creations. I hoping that if I go to bed earlier then I can get a bit of reading done because it seems the only time I get a bit of peace and quiet. I have a pile of unread books that wave at me from the bedside cabinet and I see more books I want all the time and have to restrain myself. I take loads of photo's of Bubba and Bubba and Hubby but I'm always behind the camera and I'd love more photo's of Bubba and I together. So I'm going to start to try and use the timer on my camera to capture some funny moments of us girls. We live in Kent and don't seem to go further afield. There are a few national trust property's we would like to visit and we are toying with the idea of membership, I also like seasides and Whitstable isn't too far so it would be good to get out more. Bubba is addicted to Peppa and I know she would love going to see Peppa in person so I've decided that we should visit. So hopefully we will get there this year. So as you see, not really ground breaking but still they are things that would make a difference to our little world. 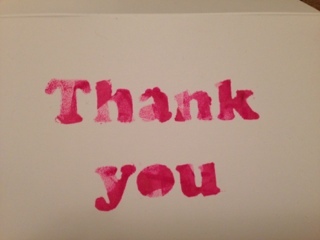 Although bubba is too young to understand, I think it's important for her to acknowledge (in writing) how thankful she is for the wonderful gifts she receives as she gets older. So this year I decided she could help me decorate the cards (as she can't really write them just yet). As I established when we sat down before Christmas, she isn't yet into crafts and would rather stand on a chair, walk around with paint or just wander off. So I wanted to keep it simple and quick so that she didn't loose interest too quickly. I printed off some words and carefully cut out the lettering with the thought that we could paint over them like a stencil. 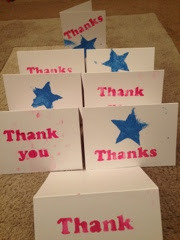 I started with stars and it all got a bit messy and so we switched to just stamping with some small square craft stamps. It worked well and she seemed to like the novelty of it, until instead of stamping the lettering, she started doing hand and finger stamping over all the place. In the end I gave up and let her embrace it, I guess it makes them more personal!